SOUL Kitchen Co is located along F. Torres cor. Mabini Street. It's a grab and go store and offers fresh, cold-pressed vegetable and fruit juices, almond milks, perfect for health-conscious millenials and urbanites (I think we all need to take care of our wellbeing because health is wealth!). We also tried their Sushi Burrito which comes in two flavors: Shrimp Tempura and Kani. The serving size wasn't too big but I was surprised that it felt like I ate 10 pieces of California Maki. And oh, IT'S SO DELICIOUS. SO WORTH IT. And you don't need to worry about the calories you consumed because healthy food is healthy. It's really nice to know that Davao has finally caught up with this healthy trend. It's about time! I'll leave you with these mouthwatering photos of Soul Kitchen Co. 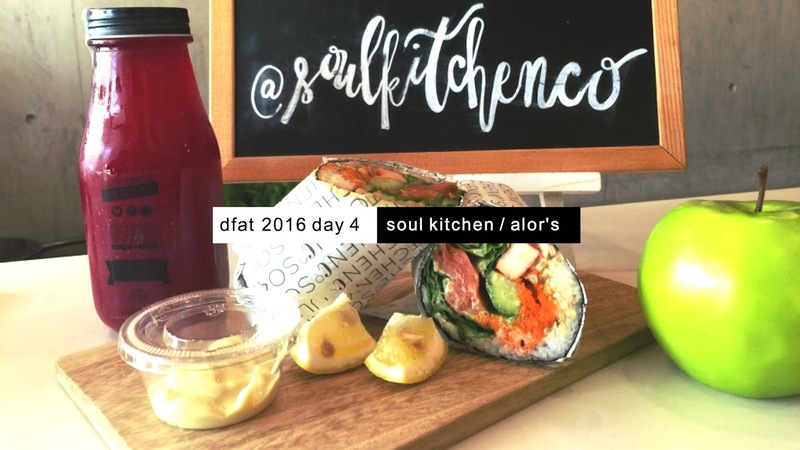 Soul Kitchen Co supports #Du30! Just a few hundred meters away from Soul Kitchen Co. is a restaurant that has been in the city for decades. Yummy/Alor's Home Kitchen is a great place to enjoy delicious food with your family or friends. Not only that, they also accept catering services. Pasta ala Telefono, my personal favorite. So creamy!!! No wonder most of my uncles and aunts who grew up in Davao frequented Alor's. The food is really great, not to mention that the place has a homey vibe. For reservations and inquiries in their catering services, please contact (082) 2225599. They are open from Monday to Sunday, 9am to 9pm. As I fastened my seatbelt, I felt sad knowing that I would never have this experience soon. To tell you the truth, I am missing all the people in #DFAT2016. Obviously, it was a fun experience. Furthermore, I will never get tired of promoting my beloved hometown to my non-Davao friends. Davao's food scene is so diverse that you'd go crazy in choosing the restaurants to try. So many restaurants, so little time. I really hope that through my DFAT posts, more and more people would come to Davao and discover that life is truly there. To my fellow participants in DFAT 2016, I hope to see you all this August 24-27 in Cebu for the Cebu Food Crawl 2.0!